Pearls are formed when, either by accident or by plan, a foreign body is introduced into the mollusk and calcium carbonate is secreted. The calcium carbonate crystallizes as aragonite (nacre) and is bound together by conchiolin. 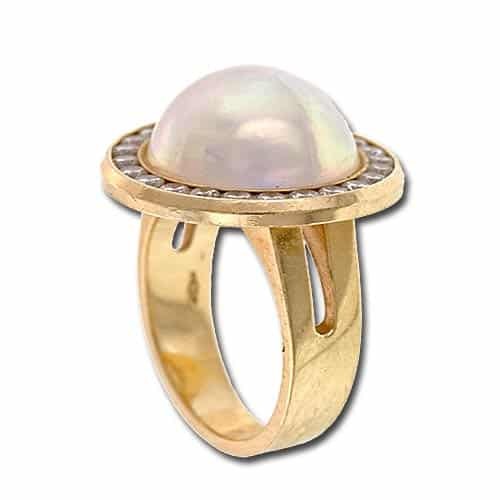 The nacre envelopes the intruder, layer by layer, eventually forming a pearl. 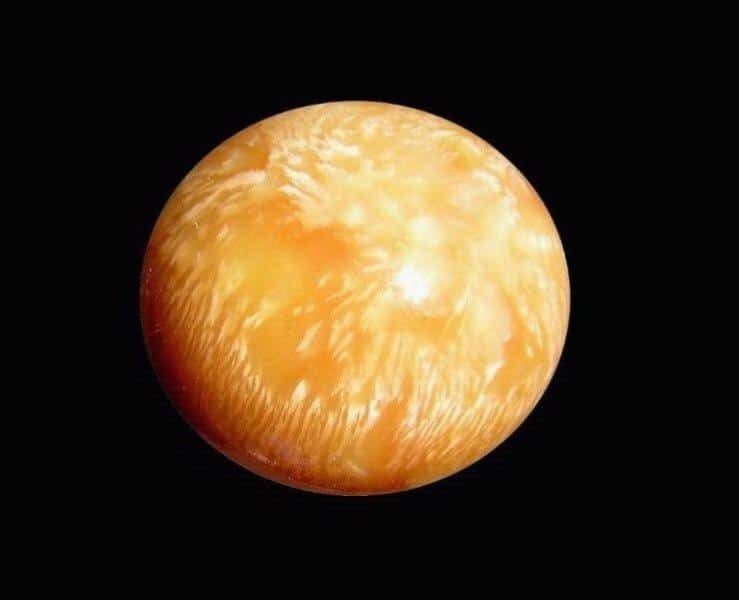 The orthorhombic aragonite crystals arrange themselves into an overlapping pattern held together by conchiolin. When light hits the surface and shines through the layers of nacre, we perceive iridescence. 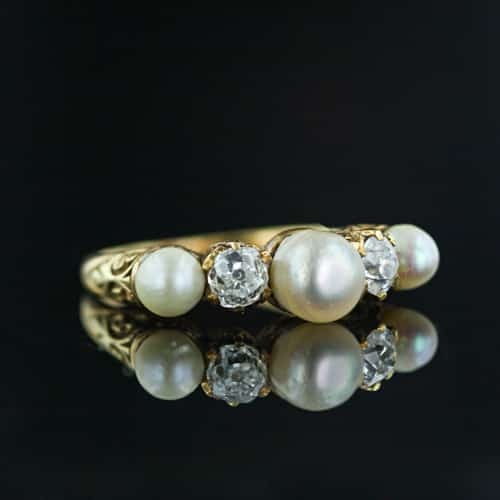 Pearls are judged by a number of different factors including: Luster, a measure of the light reflections from the pearl’s surface and that subtle glow from within. 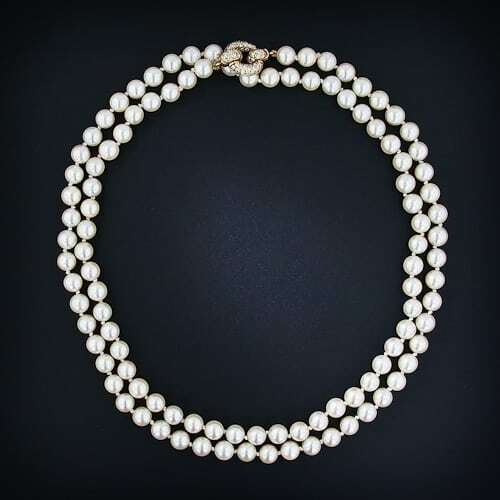 Size, larger pearls are more rare and are thus usually more valuable. 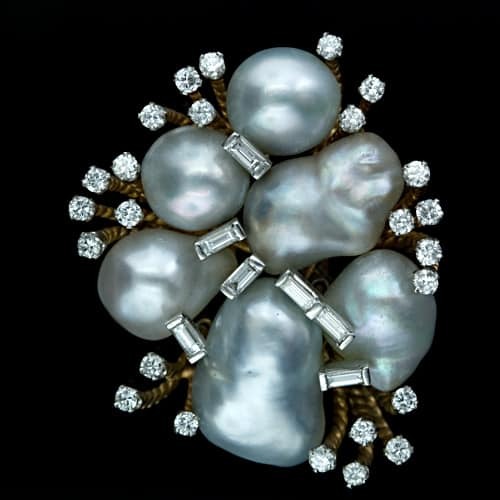 Shape, pearls are generally considered to be “classical” (round) or “baroque” (not round). Flaws, the fewer flaws, the higher the value. And finally, color, which is stated in terms of body color, overtone, and orient. 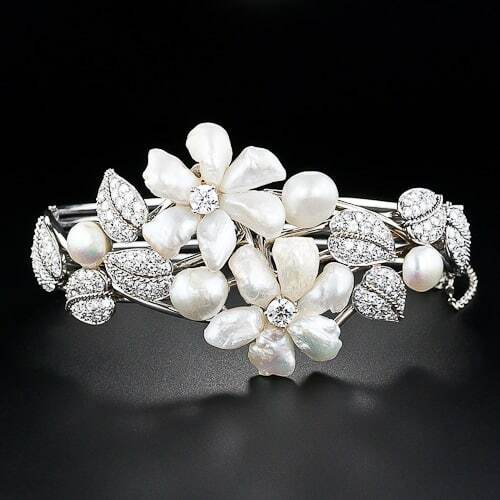 When pearls go to market they can have a “grade” assigned to them according to their nacre thickness. The most commonly used grading scale is the “AAA-A” system which assigns AAA to the most flawless, lustrous pearl, AA to those with a few flaws and a high luster and A to the least desirable pearls. This scale is generally applied to pearl strands and tends to be very subjective, even misleading. 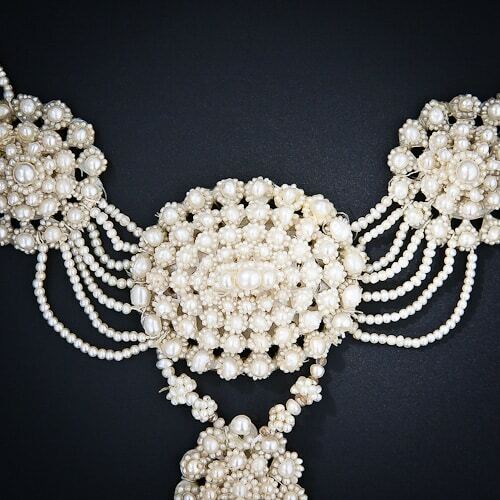 Pearls are referred to by their origins and/or their shape. 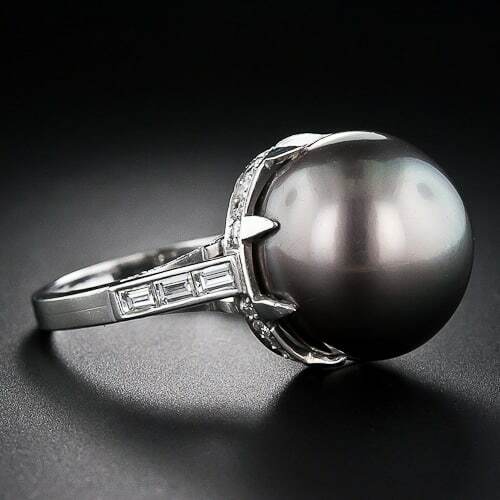 Example: Baroque Tahitian Pearl states both a shape – baroque and an origin – Tahitian. The following charts define and illustrate these pearl terms. Natural Natural pearls form by chance when an irritant enters a mollusk and sticks between the shell and mantle. Mantle tissue forms over the intrusion forming a pearl sac. Calcium carbonate crystallizing as aragonite, bound by conchiolin, is secreted by the mantel and deposited in layers over the irritant. The thicker the nacre the more lustrous the pearl. Natural pearls are very rare today. 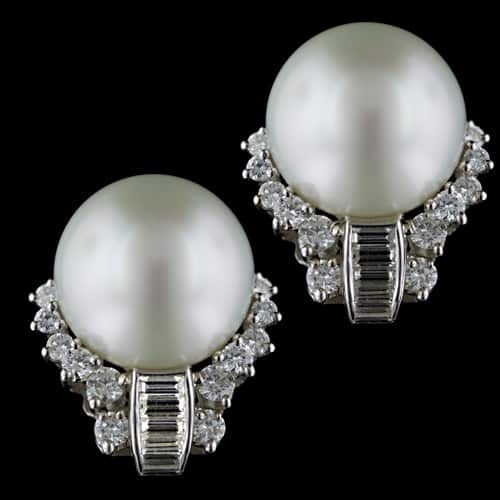 Sometimes referred to as fine, wild or oriental pearls. Cultured A salt water cultured pearl is one in which a bead nucleus is inserted into a mollusk to provide a structure for the pearl’s formation. Mantle tissue inserted with the bead begins the pearl sac formation. Calcium carbonate, crystallizing as aragonite, bound by conchiolin, deposits around the bead in overlapping layers creating a nacreous coating. 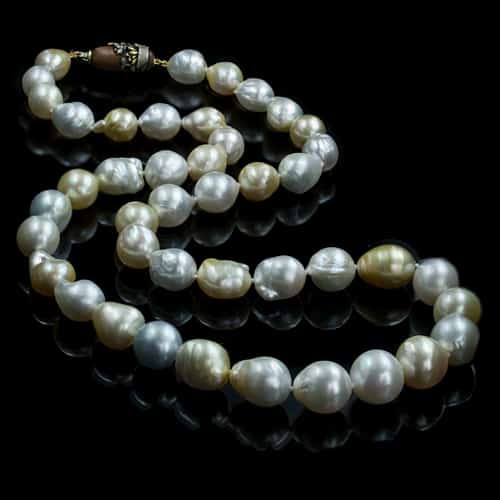 Most freshwater cultured pearls have only donor mantle implanted to start the pearl process. Saltwater Saltwater Cultured pearls are those cultivated in mollusks that thrive in saline environments. Akoya Akoya pearls are cultured in the Pinctada Fucata Martensii mollusk. They are farmed in Japan and China. Usually under 10mm in size and white or cream color with rosé or silver overtones. 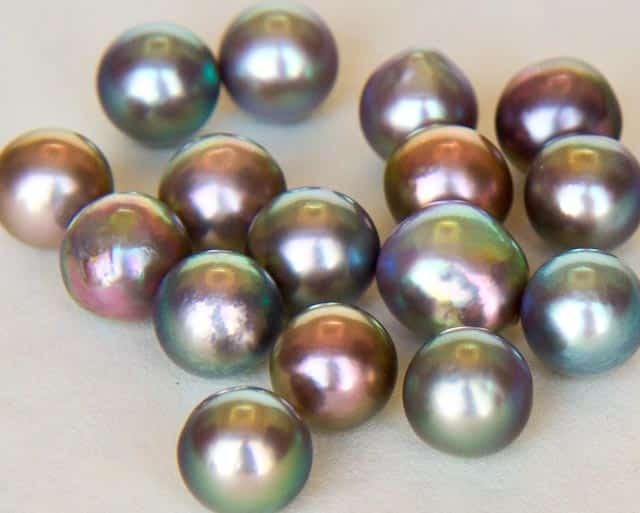 Tahitian Tahitian pearls are a product of the Pinctada Margaritifera and are a dark silvery or rich charcoal color with green or purple overtones, usually larger than 10mm. They are farmed in the French Polynesia region, Gambier Islands and Micronesia. 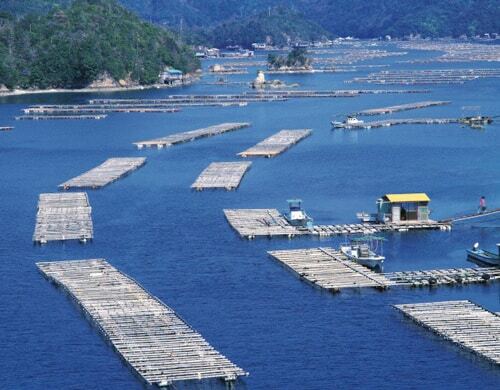 Sea of Cortez The only marine cultured pearl farm in the Western Hemisphere is in Mexico’s Gulf of California. Sea of Cortez pearls are cultured in the Pteria Sterna mollusk and the color runs the gamut from white to nearly black with rainbow overtones. They range from 8mm to 14mm, with those over 10mm being very rare. Sea of Cortez pearls have only recently begun to be cultured. Freshwater Freshwater pearls, natural and cultured, form in mollusks commonly found in freshwater. They are typically baroque and can occur in a variety of colors. Cultured freshwater pearls are usually nucleated with donor mantle tissue only. 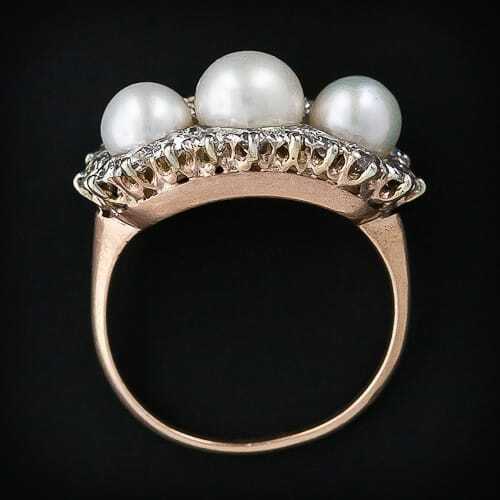 Mississippi Mississippi pearls are a type of natural baroque freshwater pearl found in the Mississippi River. 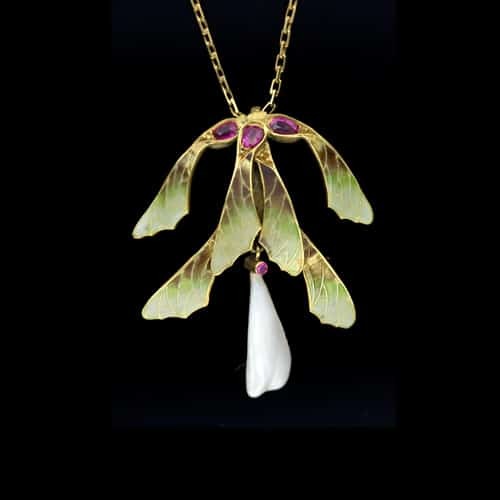 They were used in Art Nouveau and Arts & Crafts Jewelry. 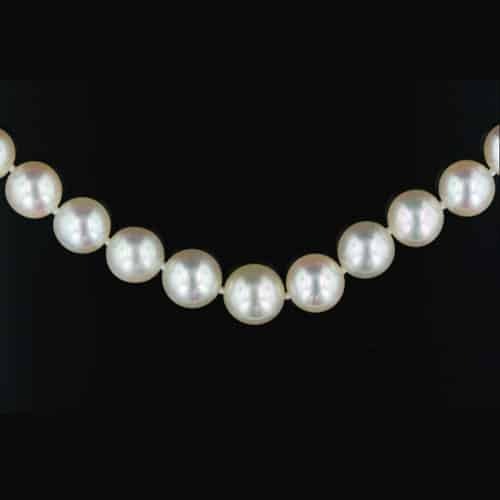 Mississippi pearls usually have an elongated “tooth-like” appearance with low luster. Round A round pearl is a nearly perfect spherical pearl. 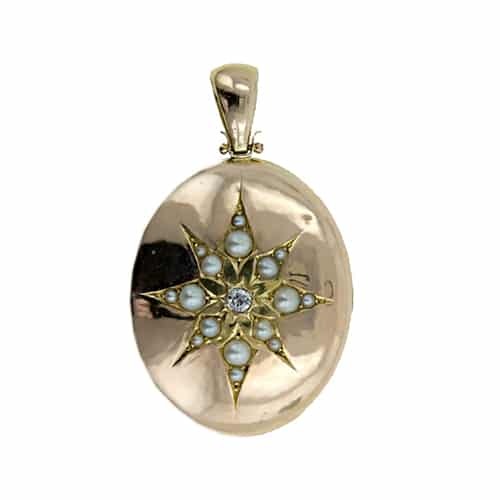 Baroque	 Baroque pearls are any pearl that has a non-spherical irregular shape. Blister Blister pearls are attached to the mollusk’s shell as they form. To be released from the mollusk they must be cut away from the shell, thus one side is flat with no nacre. 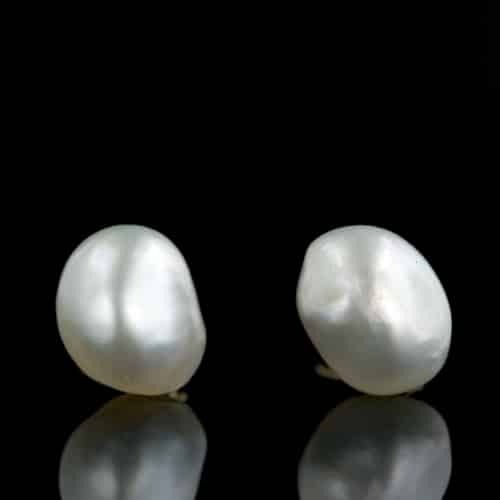 Mabe	 Mabe pearls are cultured blister pearls with a hemispherical nucleus placed against the shell wall (not in the tissue as with other cultured pearls). After the domed pearl is cut away from the shell the nucleus is removed and replaced with resin. The open side is covered with mother-of-pearl. Mother-of-Pearl	 Mother-of-pearl is the iridescent inner lining of a mollusk shell formed from layers of nacre secreted by the mantle. Mother-of-pearl is used in thin slices for inlay, carved for jewelry, used to back mabe pearls and carved as buttons and cameos. 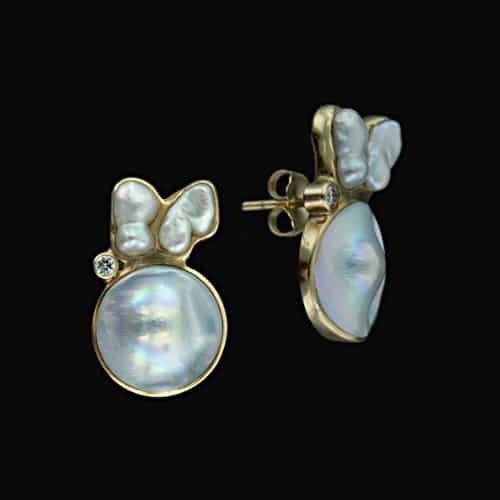 Keshi Keshi forms when the mollusk rejects the bead nucleus or as an accidental non-nucleated by-product that can form during the cultured pearl process. Keshi are 100% nacre and therefore are more lustrous than bead nucleated pearls. Keshi are not considered “natural” because they are a by-product of the pearl culturing process. 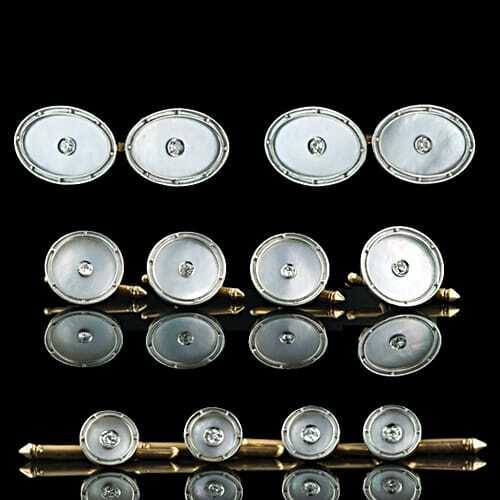 Button A button pearl is round and has a flattened outline, like a button, but is coated with nacre on all sides. Also known as a bouton pearl. 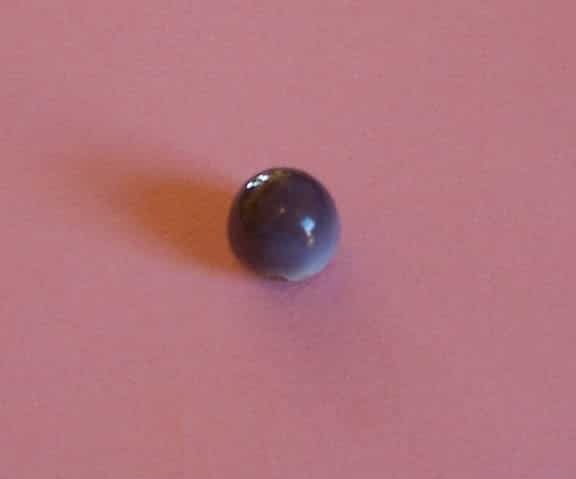 Three Quarter	 Whether cultured or natural, a three quarter pearl results when a spherical pearl forms with one small flat side. In the case of a cultured three quarter pearl, the nucleus remains after sawing the pearl from the shell. Half In modern terms a half pearl often refers to a mabe pearl. 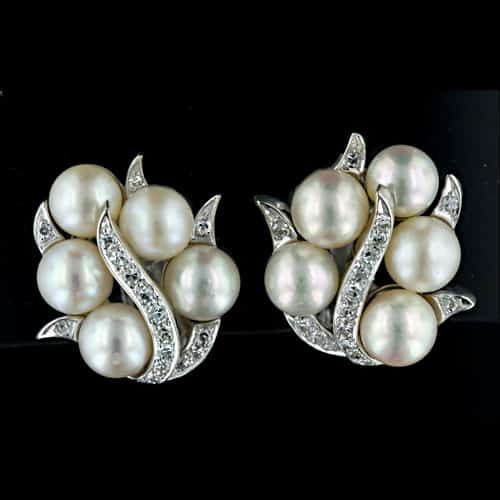 In antique jewelry smaller half seed pearls, one to four millimeters, were mounted in jewelry as accents or framing for another gem or feature. 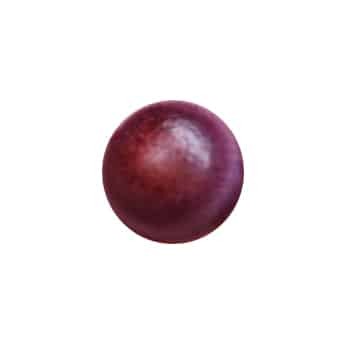 Occasionally half pearls are formed similarly to three quarter pearls and are larger than seed pearls. Conch	 Conch “pearls” are not truly pearls but are non-nacreous calcareous concreations. 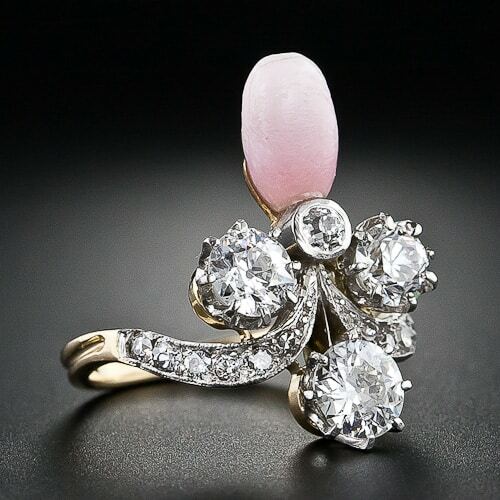 Usually conch pearls are pink to peachy in color with a flame-like pattern. They typically form in the Queen Conch aka Strombus Gigas. Melo Melo	 Melo Melo “pearls” are not truly pearls but are non-nacreous calcareous concreations. Formed in a marine snail as the result of an invading foreign substance, these “pearls” are very rare and range in color from tan through orange to brown. They can grow to be extremely large. 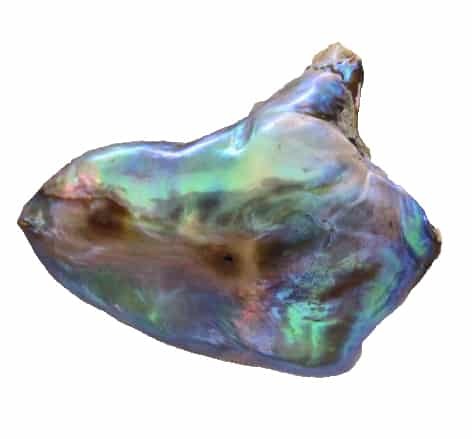 Quahog	 Quahog pearls are purple to purplish gray “pearls” that can be found in the Mercenaria Mercenaria clam shell. The pearls are rare but the clams are commonly found in the Atlantic along the Massachusetts and Rhode Island shores. Abalone Abalone pearls form in the very colorful abalone Haliotis gastropod mollusk. Found in rocky coastal waters world-wide they very rarely produce pearls. The mollusk coats intruders with nacre to encapsulate their threat to the mollusk resulting in a “pearl”. They can be quite large but are always baroque. They are difficult to culture due to their delicate nature. Scallop Scallop pearls develop in a mollusk called Mano de Leon for its lion’s paw shape. These scallops are native to the West Coast of North America and the Baja region of Mexico. Scallop pearls are extremely rare therefore they are not sought for their pearls. They occur in shades of purple, brown, orange and pink. Cave Pearls From the Carlsbad Caverns. 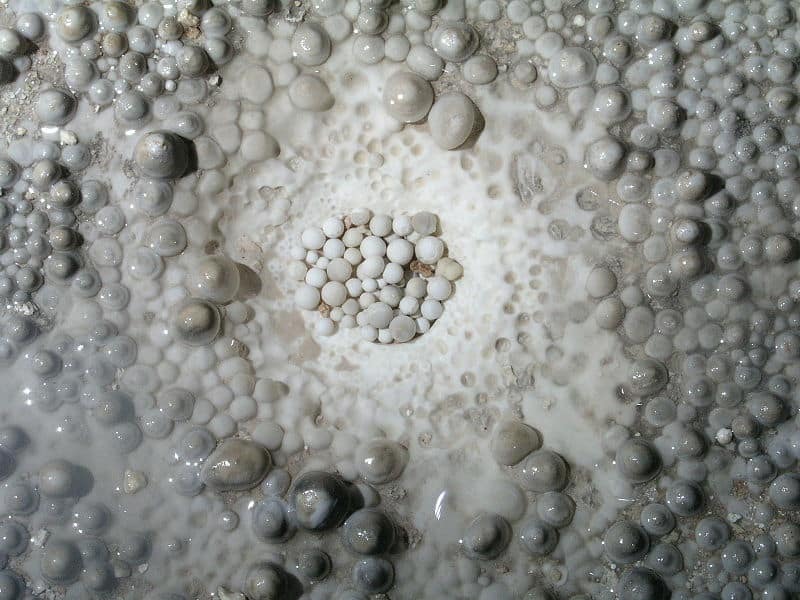 Cave	 Cave pearls develop in limestone caves when calcite deposits itself on a nucleus (such as a sand grain) while spinning in water current. As the layers build, they are rounded and polished by the action of the water. The result is a porous sphere.